Arafat’s eventual successor, Mahmoud Abbas (Abu Mazen), also embraced Temple Denial. ... Temple Denial spread across the Middle East like wildfire from the editorial pages of al-Jazirah in Saudi Arabia to well-funded international seminars in the United Arab Emirates. It even subtly slipped into the writing of Middle East-based Western reporters. Thus Time magazine’s Romesh Ratnesar in October 2003 described the Temple Mount as a place ‘where Jews believe Solomon and Herod built the first and Second Temples.’ In three years, Arafat’s campaign had convinced a leading U.S. weekly to relate the existence of Jerusalem’s biblical temples as a debatable matter of religious belief rather than historical fact. Arafat had moved the goalposts of historical truth. JOSEPHUS’ TESTIMONY -- Ancient historians from the Roman era such as Josephus have provided detailed descriptions of the Second Temple as well as the planning and execution of its destruction by Titus, the son of Roman emperor Vespasian, and his successor. ARCH OF TITUS IN ROME -- Indeed, any tourist visiting the famous Arch of Titus in Rome can see how the Roman conquest of Jerusalem was commemorated over nineteen centuries ago with engraved images of Roman soldiers triumphantly carrying the Temple vessels, including trumpets and the seven-branched Menorah, as spoils of war. ITEMS FROM THE TENTH ROMAN LEGION -- Throughout Jerusalem’s Old City, a variety of everyday items have been found that bear the mark of the Tenth Roman Legion--the unit that destroyed the Second Temple. THE TRUMPETING PLACE -- The excavation of the street level just below the Temple Mount revealed huge blocks of stone that toppled down during the Temple’s destruction, including one with a Hebrew inscription reading ‘To the Trumpeting Place.’ This corresponds with Josephus’ account of a corner of the Temple Mount where the Temple trumpet was blown to mark the beginning of the Sabbath. The eight-foot-long stone was apparently hurled down by the Roman armies from the Temple area to the pavement surrounding the Temple Mount below. Throughout the twentieth century, even extremist Muslim leaders and organizations acknowledged the Temple’s existence. For example, a guide to the Temple Mount was published in 1935 by the Supreme Muslim Council, which at the time was headed by Hajj Amin al-Husseini, the notorious pro-Nazi mufti of Jerusalem. Concerning the Temple Mount (‘Haram al-Sharif’), the guide stated without equivocation that ‘Its identity with the site of Solomon’s Temple is beyond dispute.’ This mimicked the language of an earlier guidebook the council had written in 1924. Thus the claims of Arafat and his acolytes throughout the Arab world that the Temples never existed in Jerusalem are refuted not only by the archaeological record, but also by Islam’s greatest authorities and even by Arafat’s radical predecessors. 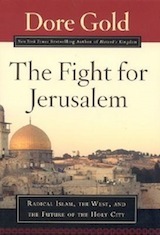 Except for the material within the brackets, the previous is adapted from The Fight for Jerusalem: Radical Islam, the West, and the Future of the Holy City by Dore Gold (Washington, D.C.: Regnery Publishing, 2007). There are also the temple stones that witness to the Jewish Temple. The Lord Jesus prophesied that the beautiful temple and the surrounding buildings would be destroyed and “there shall not be left one stone upon another, that shall not be thrown down” (Mark 13:2). This was fulfilled 40 years after His resurrection when the Roman army under Titus conquered the city and destroyed the temple. Some of the stones that tumbled off the mount during this epoch event have been unearthed along the Western Wall and can be seen there today. In a house unearthed in the Old City there is a drawing of a temple menorah dating to the first century B.C. This can be seen in the WOHL Archaeological Museum. In 2009 Dr. Eilat Mazar, world authority on Jerusalem’s ancient archaeology, discovered the ruins of what is believed to be David’s palace. She found evidence that this was David’s actual palace and that it was occupied up until the destruction of Solomon’s temple by the Babylonians (“The World of Archeology Is Rocked,” aish.com, July 6, 2009). It was here that the aforementioned Jehucal bulla was found. Eilat is the granddaughter of Benjamin Mazar, and in their last conversation before his death in 1995, they discussed the recovery of David’s palace. She holds a doctorate in archaeology from Hebrew University and is the author of The Complete Guide to the Temple Mount Excavations. In the 1990s two small silver scrolls were found in an ancient tomb on Ketef Hinnom (the shoulder of Hinnom), on the side of the Valley of Hinnom. After being unrolled by the Israel Museum, the scrolls were found to contain the priestly blessing from Numbers 6:24-26. Dating to the 7th century B.C., these are the oldest portions of Scripture in existence, predating the O.T. scrolls from the Dead Sea caves by 500 years (“Jerusalem: Silver Plaques Inscribed with the Biblical Priestly Benediction,” Archaeological Sites No. 1, Israel Ministry of Foreign Affairs, July 29, 1998, http://www.mfa.gov.il/MFA/IsraelExperience/History/pages/Archaeological%20Sites%20in%20Israel%20-%20Jerusalem%20-%20Silve.aspx April 27, 2010). In 2008 the Jewish Temple Institute acquired a copy of the 1925 edition of the guidebook published by the Supreme Moslem Council, which states the following: “Its identity with the site of Solomon's Temple is beyond dispute. This, too, is the spot, according to universal belief, on which ‘David built there an altar unto the Lord’” (Arutz Sheva, Sept. 2, 2008). In March 2008 the Israel Antiquities Authority announced that first the first time in the history of archaeological research of Jerusalem remains from the First Temple have been found close to the Temple Mount. “A rich layer of finds from the latter part of the First Temple period (8th-6th centuries B.C.E.) has been discovered in archaeological rescue excavations near the Western Wall plaza. ... The Israel Antiquities Authority has been conducting the excavations for the past two years under the direction of archaeologists Shlomit Wexler-Bdoulah and Alexander Onn, in cooperation with the Western Wall Heritage Foundation. The remains of a magnificent colonnaded street from the 2nd century C.E. were uncovered; the street appears on the mosaic Madaba map, and is referred to by the name Eastern Cardo. The level of the Eastern Cardo is paved with large heavy limestone pavers that were set directly atop the layer that dates to the end of the First Temple period. This Roman road thus ‘seals’ beneath it the finds from the First Temple period, protecting them from being plundered in later periods. The walls of the buildings found in the dig are preserved to a height of more than two meters” (“First Temple Building Remains Found Near Temple Mount,” Arutz Sheva, Israel National News, March 17, 2008). In 2008 a coin from the year 66 AD, the first year of the Jewish revolt, was found in debris excavated from the Temple Mount itself. The debris was excavated illegally by the Muslims in 1999 and discarded in the Kidron Valley and elsewhere. Israeli archaeologists have been sifting through the debris, and the coin is one of their finds. The ancient half-shekel coin is inscribed with “The Holy Jerusalem” on one side. The coin has been damaged by fire, perhaps even the fire that destroyed the Second Temple in 70 AD. In December 2011, A SEAL ASSOCIATED WITH RITUAL PURIFICATION RITES in the Second Temple was found. The seal was discovered during excavations under the Robinson’s Arch next to the Temple Mount. The seal, which is inscribed with the Aramaic words “Pure for God,” was found in soil dating to or just prior to the first century A.D. Archaeologist Eli Shukron of the Israel Antiquities Authority and Professor Ronny Reich of the University of Haifa said: “It constitutes direct archaeological evidence of the activity on the Temple Mount and the workings of the Temple during the Second Temple period” (“Seal Found in Temple Mount Excavation,” Jewish Press, Dec. 26, 2011). Leaving the land of Israel itself, there is powerful evidence in Rome for the Second Temple and its destruction according to Jesus’ prophecy. It was a Roman army that destroyed the Temple under the leadership of Titus, and the artifacts were transported to Rome. Titus became emperor, and in 85 A.D. a monumental arch was dedicated in commemoration of his victory over the Jews. A bas-relief inside the arch depicts the spoils from the Jerusalem Temple carried in a victory procession after Jerusalem’s fall. Clearly seen are the candlestick and the silver trumpets. You can disbelieve the Bible and it’s description of Israel’s history if you wish, but you cannot honestly say there is no evidence that it is true.